Learn how to set a multi-state complex match and trigger a capture for a USB mouse, and view all of the pre-trigger data using the Beagle USB 5000 v2 SuperSpeed Protocol Analyzer. Working with I2C? Learn how to quickly and easily program an I2C EEPROM using the Aardvark I2C/SPI Host Adapter and the Control Center Software. Visit Total Phase at Design West and Receive a Special Gift! Total Phase will be exhibiting at the Design West Expo in San Jose, California from April 23-25. Drop by our booth to say hello and experience a live demonstration of any of our USB, I2C, SPI, and CAN tools, including the award-winning Beagle USB 5000 v2 SuperSpeed Protocol Analyzer as well as the 2013 Best in Test/Test of Time Finalist, the Aardvark I2C/SPI Host Adapter. Learn more about our new support for the full line of Spansion NOR flash memory and the addition of the latest Micron NOR flash memory as well. Additionally, we will be giving away a special gift – your choice of a free 10-pin split cable or flash SOIC-8 board. 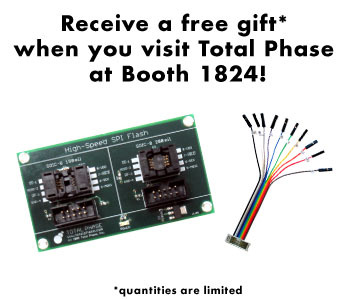 Quantities of both items are limited, so be sure to stop by and ask any representative at the Total Phase booth 1824 to claim your free gift! Total Phase is excited to take part in a hands-on training session at Design West this year, titled "Essentials of USB Device Development." This class will focus on providing a foundation of important factors for successful USB device development. Attendees will be introduced to time-saving USB software and tools through several hands-on exercises. This is not the first time the Beagle USB 480 analyzer has been featured at a Design West class! 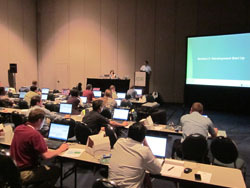 In 2011, Total Phase hosted a hands-on training lab emphasizing efficient I2C, SPI, and USB debugging and development. We are thrilled to have the Beagle USB 480 Protocol Analyzer included as one of the time-saving tools in "Essentials of USB Device Development." This class will be held on Monday, April 22, 2013 at 1:30PM in room 210 CD at the McEnery Convention Center. Christian Legare, Executive VP and CTO of Micrium, will be the main speaker while Total Phase's own Tabitha Miller will also be present at this session to assist and answer any questions attendees may have about the Beagle USB 480 analyzer. Space is limited and available on a first come, first serve basis, so be sure to arrive early! For more information on other conference sessions at Design West, click here. Hot off the virtual press – Total Phase recently released our latest white paper, which is available for download from our website. Here at Total Phase, one of our core values is to provide trusted and innovative development tools for engineers for debugging and programming across USB, I2C, SPI, and CAN. 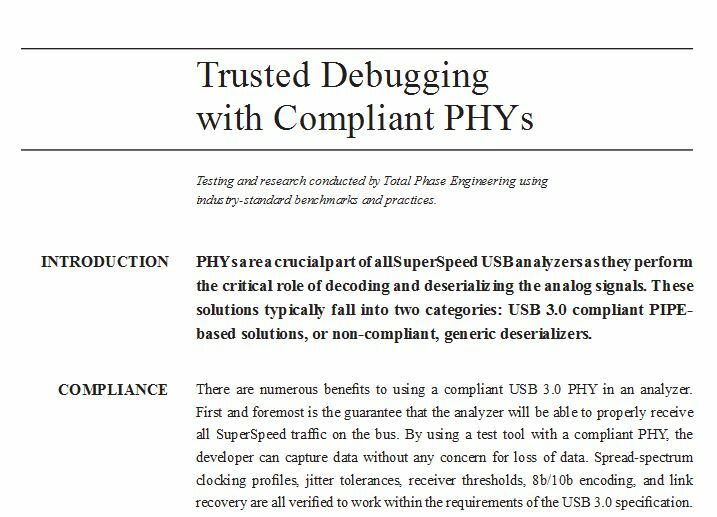 Our latest white paper, Trusted Debugging with Compliant PHYs, zooms in on how PHYs are a crucial part of a SuperSpeed USB analyzer's performance in capturing, receiving, and analyzing data from a USB 3.0 bus. Interested in downloading other white papers from Total Phase? Our library of white papers is always growing. Some other topics include enhancing productivity with true real-time USB protocol analyzers and case studies on how engineers have used our Beagle protocol analyzers for their projects. Read more here. The Aardvark I2C/SPI Host Adapter is a really cool little tool and great job on the software! It was very easy to get going.